You are here: Home / home tour / Easy Colorful Spring Decorating Ideas to Try Now! Easy Colorful Spring Decorating Ideas to Try Now! Tired of waiting for your dream home? Love your space once and for all with a FREE 5 Day email course! Sign up for immediate access, weekly updates, and exclusive offers... it's free! Welcome to our colorful spring home tour with simple decorating ideas. Part of It’s a Very Colorful Life Home Tour: Spring Edition. I’m so excited to be joining some wonderful ladies in a colorful spring home tour hosted by Dimples and Tangles and Jeweled Interiors. If you are coming from Monica’s gorgeous spring home from Monica Wants It, hi there! If not, make sure to scroll to the bottom of the post to see all of the participating bloggers. Let’s start at the foyer, shall we? We’ve been in this house six months now and really have only completed a bedroom and a bathroom makeover. But I am happy with how our main living areas are shaping up. We have a small ranch style home so you see everything as soon as you walk in! Here is an elegant and eclectic spring wreath I made recently for A Very Global Easter series. From the front door is the large open space. Since this tour is all about color, I actually painted our brown mantel to a blue black and rearranged the bookcase with colorful books color coded instead of its usual neutral styling. Some fresh purple tulips steal the show on our coffee table. I recently added decorative rock grapes that were my grandmothers and brass cranes from my grandfather. Our home is full of sentimental items! Add a no fuss flower arrangement with tulips or daffodils. Fill in an empty hearth with a fern for spring. Most of our decor is from living in Japan and traveling in Asia. I’ve also acquired art and furniture from my grandparents that I love having close by. This corner got a spring refresh with a lighter piece ink painting and new friend. Name suggestions please! When you face the other direction are in front of the dining area and kitchen. I love the pop of color our bar cart vignette adds. I found the painting at an estate sale with my grandpa and added faux floral and more blue and white pieces to emphasize the interesting color palette. Since the living and dining areas on our my list for the upcoming Spring One Room Challenge, I decided to play around with the dining furniture arrangement to see what works best. We are currently trying a banquette style eating area and so far love it. There is still plenty of room to set up folding tables (with pretty linens off course) in our living room for large dinner parties! I also made a change to our recent small bathroom makeover by moving a large floral painting by my aunt from the living room to above the toilet and LOVE it. It will definitely live in here for awhile. You can find out how I changed our bathroom for under $150 with a small bathroom makeover on a budget. Rearrange artwork to highlight spring colors and themes. The last space I wanted to share because it’s too cute not to! 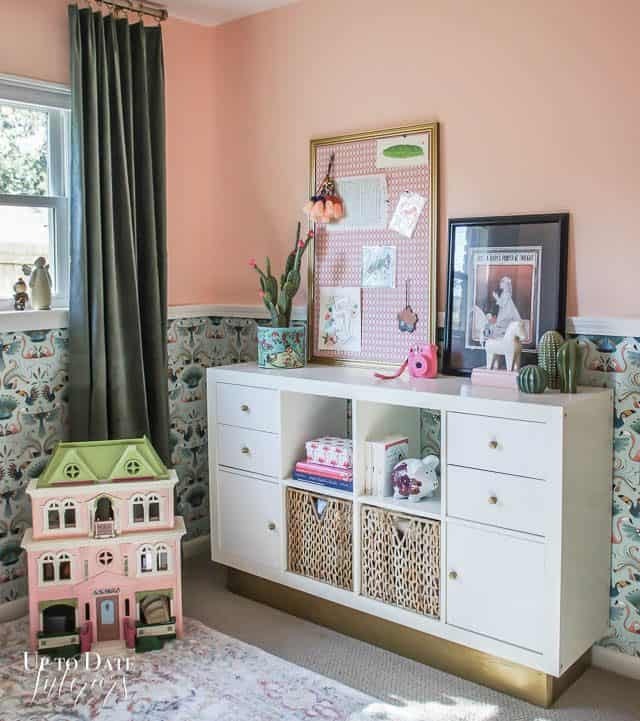 My daughter’s room I completed for the New Year New Room Challenge but added a couple of bunnies and a DIY tassel basket with some easter eggs for spring. I hope you enjoyed seeing our home before the next big changes come! Make sure to stop by SKG Designs who is finishing up the tours for today. Then come back tomorrow for the last talented bunch! Chai tea addict. Classical music lover. Decorating and DIY fanatic. Mom, wife, piano teacher, and twin. Founder of Up to Date Interiors. « Try this Easy Ikea Play Kitchen Hack Tutorial! It’s so much fun to see your new house Kathy!!! Congrats! I bet that feels so good to be so settled already. Very lovely! Thank you Jewel! It does but now it’s time to make it better. Wahoo!! Let the craziness begin! Love that large floral over the toilet in the powder room and obsessed with your daughters wallpaper!! And of course all of the blue and white from your time overseas!! Thank you Marcie! I’m obsessed with that wallpaper too. It’s so cool! Your home is so gorgeous- I can’t believe how much you’ve accomplished in such a short time frame. Your living room is perfection! Those are two of my favorite spots! Thanks so much Jamala! You’ve done SO much Kathy!! Everything looks so pretty. I’m sure you’re thrilled!! Happy spring!! Thank you Heather! Happy spring! Wow, Kathy….your home is looking incredible, and in such a short amount of time! Gorgeous. You make spring look good, girl! So pretty Kathy! I love the pops of color you have throughout your home and look at all those Global Easter touches. wink wink! 🙂 Beautiful tour! Hi there! I'm Kathy. Interior stylist, DIYer, and collector of all things global, eclectic, and glam. Love your space once and for all with a FREE email course, weekly decor and DIY tips, and exclusive offers! All text, images, and other content that are part of this blog are the property of Up to Date Interiors, unless otherwise noted. All material is copyright protected. I love to share with other bloggers and am glad to allow the use of a single photo and/or short excerpt with appropriate credit and a link back to the original content on Up to Date Interiors including the blog’s full name. Full tutorials or blog posts cannot be reprinted without my permission. Read more HERE. Sign up for a FREE email course, weekly decor and DIY tips, and exclusive offers.